Coromandel in New Zealand is just about 1 and a half hour drive from Auckland International Airport, and this region is among the most beautiful in New Zealand. A world part from the concrete squalor, Coromandel is a beach paradise set at a convenient location from the city. The easy accessibility makes for a convenient getaway from the hustle and bustle of city life. The Coromandel is extremely beautiful; the landscape is filled with lush greenery. The land is pristine and as yet unsullied. The pace of life is very much on the relaxed side, and makes for a great place to head to whether you are a tourist or a local. There is much to do in Coromandel, and much to like and to admire. The terrain is unique, and has immense possibilities. Also significant from a historical point of view, Coromandel has had quite an illustrious past, Captain Cook had come to this region in the year 1769 and was said to have observed the path of Mercury traveling across the sun’s face from here. The Cook’s Beach and the Mercury Bay stand in memory. The Coromandel is much more than beaches, but the beaches alone are worth visiting region. Pristine snow white stretches of sand with crystal clear waters kissing the shores, the beaches here are picture perfect. There is no dearth to key facilities as well. Coromandel’s beaches have some excellent shops, restaurants and gear shops lining them, and these are popular with locals as well as tourists to this region. The beaches here are surfer’s paradises, many high profile surfers come here. A unique experience as a beach, the reason for Hot Water beach being named as it is, is the selling point of the beach. There is an underground hot water spring here that comes up to the surface at the beach time to time. This phenomenon occurs in both summer and winter, and this is an experience unlike any other, and you can dig your own private hot water pool in the sand. The Hot Water beach is also a notable surfing beach. In reality these are two beaches that go together; one can not be named without the other. Hahei Beach is a luscious stretch of pink sand framed by towering cliff’s overlooking Hahei. There are some maori pa sites at either end of the beach. The neighboring marine preserve is a major attraction, and has a good number of diverse species of fish and sea creatures. 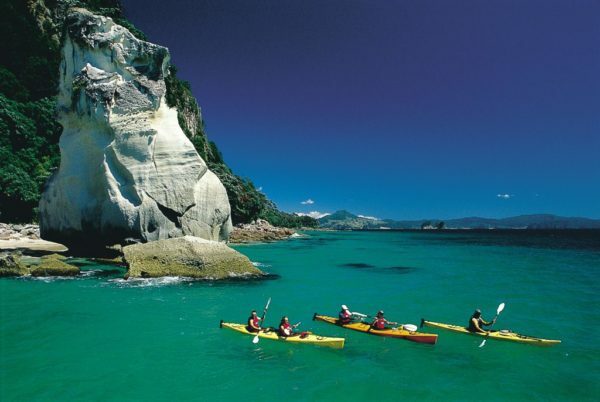 The marine reserve is where the Cathedral Cove is, and this is among the most beautiful, most popular, most photographed locations in the entire Coromandel Peninsula. 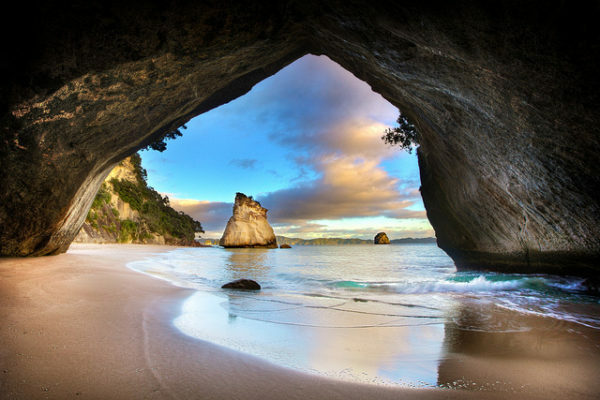 You can only access the Cathedral Cove on foot, and the cathedral-like cavern is a must see. Among the Virtually unknown beaches of New Zealand, New Chums was among the top twenty beaches in the list published by the Observer, a prestigious newspaper in the U K. The beach is not accessible by road, and you need some good walking shoes to get to New Chums. Ask locals for directions. It is certainly worth the walk, and the beach has pohutukawas lining it, and nothing much else other than the sun and the sea. A heavenly beach village enclosed by the bush and rough terrain farmland, Kuaotunu encompasses all that is good in New Zealand – The sun, sand and surf is in perfect harmony here and there are immense opportunities for all manner of water sports ranging from fishing, kayaking, snorkeling and other. The surf breaks here especially along the Blackjack Reef is popular with surfers. 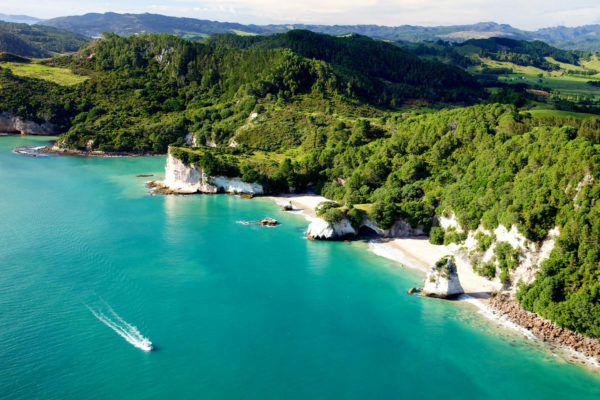 All in all, Coromandel is indeed a beach destination past comparison, and is an extremely rewarding destination to head to if you are planning to go to New Zealand.